Would you like to manually choose which graphics card is in use on a MacBook Pro? 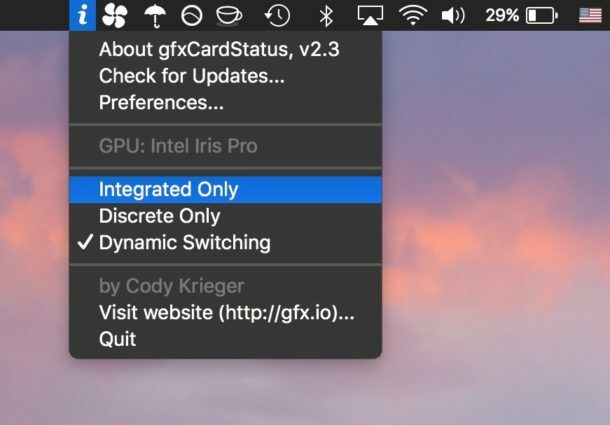 You can now keep track of which GPU is in use and then manually switch between the two graphics cards included within the MacBook Pro series, thanks to a third party utility called gfxCardStatus. It’s a free app and to be able to switch GPU on the fly all you need to do is download a utility called gfxCardStatus, we’ll show you how it works. You can get gfxCardStatus here for free, it’s donationware so if you’re thrilled with the app throw the developer a couple bucks. Once you have gfxGraphicsCardStatus installed you will gain a menu item which you can use to toggle the GPU card to the integrated GPU or the discrete GPU. It’s really that simple to switch your GPU manually. The nice little app is works with the all modern MacBook Pro’s and later with an integrated GPU and discrete GPU. If you do not have dual GPU capabilities the tool will not work. * Manually switch between the MacBook Pro GPU’s on demand through a menu bar application! * gfxCardStatus tells you which card is currently in use by adjusting the menubar icon; showing an ‘i’ icon for the Intel HD GPU, and an ‘d’ icon for the discrete card, whether it’s an NVIDIA GeForce or an ATI or AMD card. * Lists dependent processes to see which apps are currently using the discrete GPU processor. This functionality really should have been baked into a system update for these MacBook Pro’s. Since the 330m is power hungry, if you want to preserve battery life you’ll almost certainly be better off using the Intel HD Graphics card instead. Note that the application is “a little bit on the buggy side” according to Engadget, and we’d recommend approaching anything that modifies your hardware settings with some caution. Another GPU option is available for some Macs, and that is to disable GPU switching on MacBook Pro, but that’s only an option on newer model hardware. Thanks for this article. I really need this to switch graphics card on my MAC. I appreciate your work and waiting for more. Thank you so much.